U6 – a steely orange glare! Hatched on 18th 19th and 22nd of May the chicks are now entering into their 5th week of life. It is a constant source of amazement how fast they grow; from fluffy ping-pong size to fully feathered rugby balls with wings. It is at this time that we fit on their identification rings. This year, the first since 2009, we have 3 beautiful chicks. They are a credit to the care that KL and Unring have lavished on them, catching fish and feeding them throughout the hours of daylight and keeping them warm or shaded, depending on the variable Cumbrian weather. Early this summer morning the trained and licenced ringing team walked quietly over to the site. Looking up through the green oak leaves to a pale blue sky we could see both KL and Unring flying over the nest and soon could hear their cries, warning their chicks to lie down, stay still and rely upon their camouflage for protection. 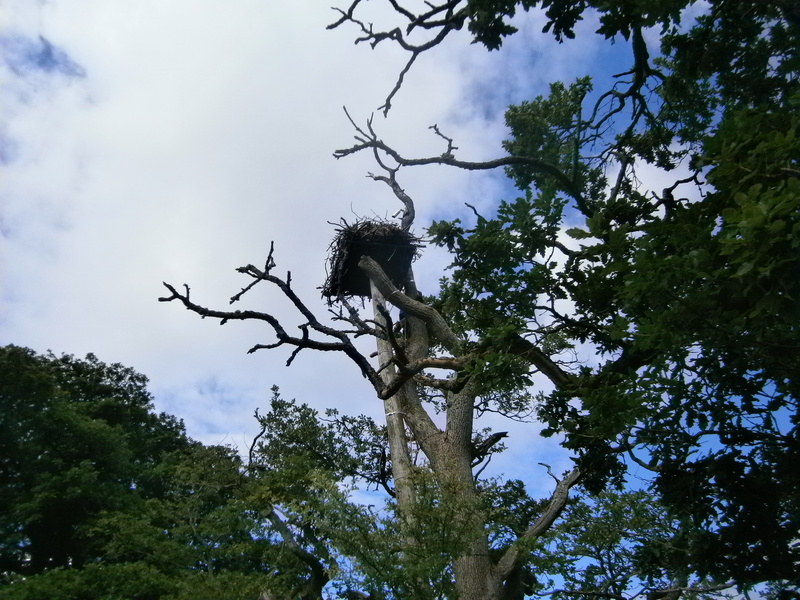 Darren, veteran tree climber, ascended and peered over the nest edge. 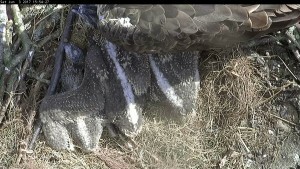 The two eldest chicks lay just as Mum could wish, flattened out and holding on with both feet. But youngest was not going to take things passively and had already reared up on its wings and legs with its neck feathers raised, like a fierce little Lygon. Gently, Darren picked it up placed it in a sports bag and lowered it to the bottom of the tree where our Ringer was waiting. Placed on the ground the young bird held its stance, looking around with orange-iris eyes at a different world of grass and buttercups. It managed a nifty peck at the Ringer’s thumb as firstly its metal ring with unique serial number was placed on its left leg and its Blue colour ring U6 was placed on the right. In future years it will be this means of identification that will tell us if it has survived the migration and returned to Cumbria. ‘ It’s so feisty, I’m guessing it’s a male, but it’s weight should confirm that.’ At 1,320 g the spring balance told us it was indeed within the male weight parameters, being lighter than females of the same age. With a flurry of quill dander and a drift of baby down it’s – no, HIS –wing measurements were taken and feet examined. Smallest and youngest but superbly healthy and bursting with attitude, U6 sat to one side watching on whilst his more docile siblings went through the same process, fitted with leg rings U7 and U8. From the weight of 1,470g the middle chick is probably another male and at a buxom 1,570 g the oldest should be female. ‘Fly well little birds’, we whispered as they were hauled up one at a time and replaced in the nest. Then we walked away to let them resume their avian lives again. 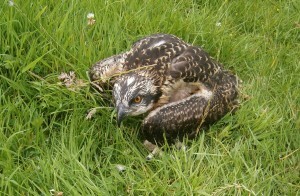 With chicks growing rapidly there has not been much space to think about No 14 and how he is faring. As you can see he has felt no urge to return to his natal site. 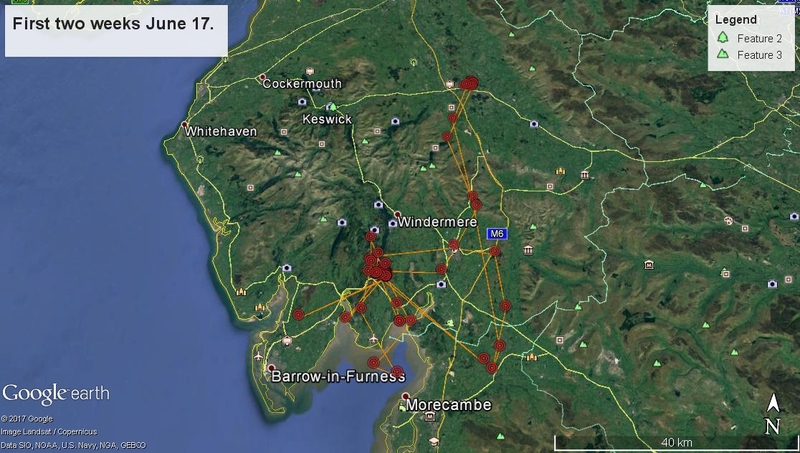 Instead he has followed a pattern similar to other juvenile ospreys in that he has a main area of interest – in this case South Lakes- and from there he makes trips out to other favoured spots. This sequence maximises the chance of his finding a nest site, a fishing ground and a lady friend. 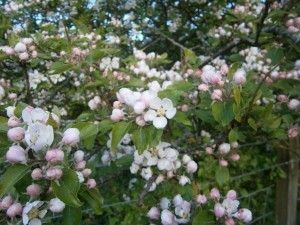 Two major hurdles are firstly, finding these factors all in one place and, crucially, winning the approval of the lady. Despite being a super flyer and unsurpassed traveller, or perhaps because of it, it does not look as if he has succeeded in settling down this season. 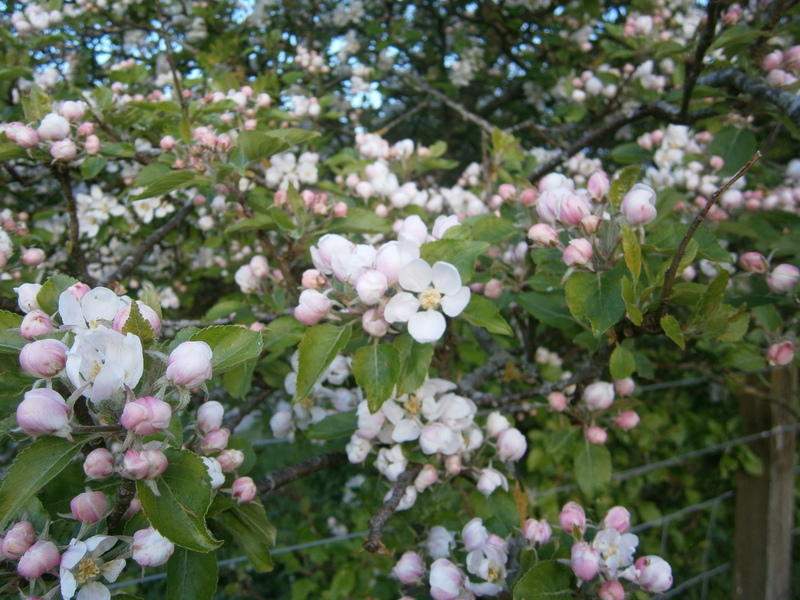 From summer heatwave to winter chill and winds –It’s flaming June! In their exposed nest site the osprey family have been a sad sight to see. 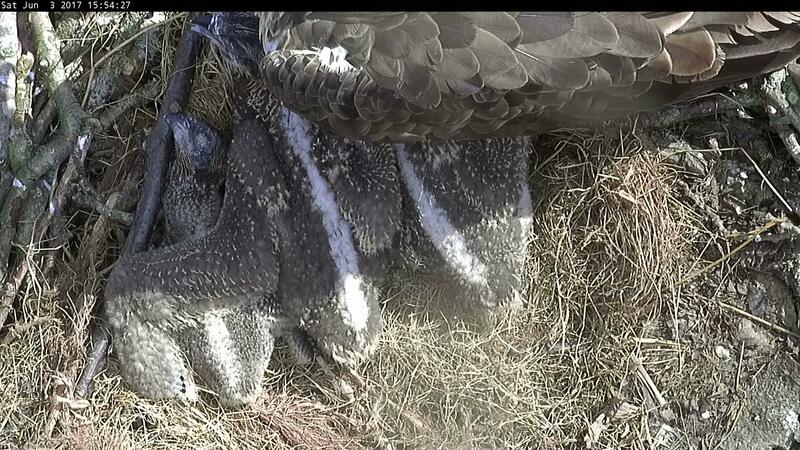 KL has spent her time crouching over her chicks trying to keep as much of them as possible warm. She has been drenched and the wind has turned her soggy feathers inside out, like an old umbrella. However, she has persisted and with Unring sitting in the alders close by to give her the occasional spell they are winning through. Fishing has been tricky with the Lake alternately rough with waves, brown with silt or pock-marked with raindrops. 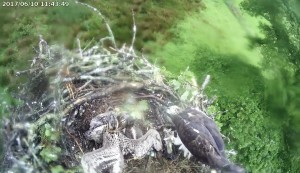 Even with his superior eyesight Unring has been bringing back smaller fry than usual – just at a time when the chicks are putting on their major growth spurt. One small pike today was demolished between them in less than 6 minutes and then they were looking for more. The eldest is over 3 weeks old now and its rugby-ball shaped body seems to be inflating every day, as well as sprouting a thick cape of feather spines. Instinctively (and probably because their emerging body fuzz itches) all three are starting to spend time preening, nibbling at the base of the spines to remove the quill casing and enable the feather inside to blossom. Wings are also extending. It’s amazing, but in a few more days they will actually begin to look like birds instead of dinosaurs! 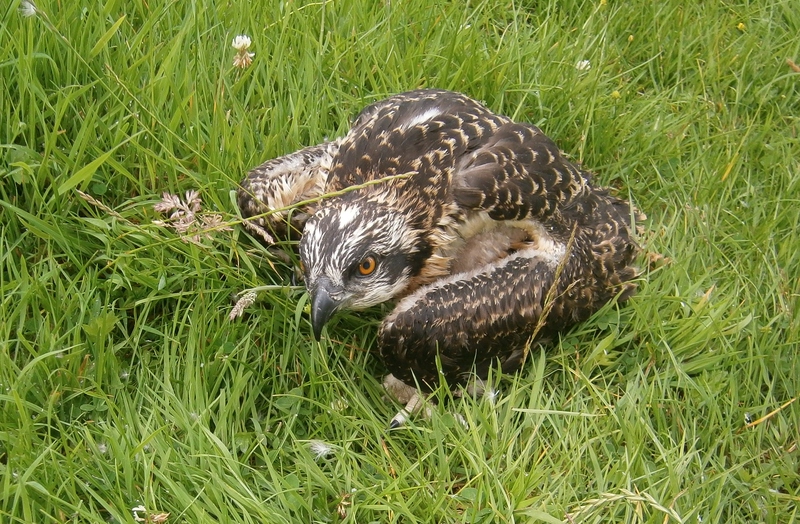 An exciting few days with sightings of ‘extra’ ospreys on the flowery shores Bassenthwaite and Derwentwater. Sunday afternoon showed watchers at the Viewpoints and at Whinlatter some spectacular behaviours with the addition of a third bird flying in the area. It started with Unring touching down onto the nest holding a fine looking perch and then despite having hungry chicks waiting, flying straight off with it again. Only a few minutes later KL started to mantle over the chicks shrieking her displeasure to the skies. Unring re appeared and sat himself on a side branch with the fish and then suddenly, perched on the top of the tree, was a stranger osprey also clutching a fish. Unring was caught in a dilemma – there was KL screeching at him to chase away this intruder – but to do this he would have to drop his hard won meal. We have seen him in this place before and as usual he seems to be a great believer in discretion being the greater part of valour – he stuck with the fish. Meanwhile ‘stranger-danger’ was eying up the nest and the female, who by this time was in paroxisms of emotion and throwing herself over her offspring who flattened themselves in the bottom of the nest. It looked like a stand-off until the stranger upped the stakes. Dropping like a stone from the top branch he landed on the very edge of the nest. 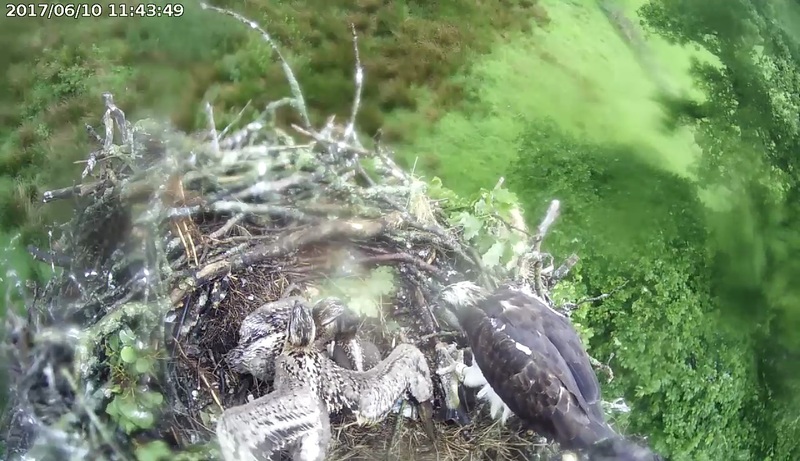 As KL lunged towards him he thrust his fish at her into the base of the nest and then with an insouciant swirl of the wing flew off low and fast towards Keswick. Whew – hot stuff! Unring seeing the retreat in his rival took off smartly and followed him at a sensible distance. KL, panting in the bottom of the nest, became aware that she was sharing the space not only with her 3 ruffled chicks but also with a particularly fine rainbow trout. Oh well! Kids have to be fed and you should never look a gift fish in the mouth. Within a few minutes the family was enjoying their unexpected bounty. But a ‘free’ lunch – we wonder? Our chicks are now about 16 days, 15 days and 12 days old and are all doing fine. Despite their size difference KL is feeding all of them and all are developing as they should. They have lost their early white down and are now at the stage when their first feathers are starting to sprout (not a pretty sight!) Often described as reptilian at this age they are actively crawling around the nest using both legs and wings to manoeuvre themselves.